You really never know how a trip is going to turn out. Sometimes everything goes as planned and other times the %@#! hits the fan. Seth, James and I started on an early note getting to Lake Placid around mid afternoon. The day was looking great, the sun was shining making it perfect for some High Peaking. Just off Route 73 a short 2.2 miles ahead Porter Mountain loomed overhead. A smooth yet Buggy 2,000 vertical accent to the top, clean and quick. Just 1.5 miles away is the Summit of Cascade Mountain , being so close you have to catch it as well. Afterwards we headed towards Lake Harris Camp Site #1 to meet up with Jess and Colleen. We all enjoyed the Wegmans Burgers minus Colleen who slept peacefully in the car. The next morning MRE's were on the menu, being my first Made Ready to Eat meal it was a good one of scrambled eggs and home fries. Day 2 was the flipside of the first,"If the Santanonis are Hell, then Bradley Pond Lean-to must be Purgatory." This seems to say it all. The grueling pace of dripping wet body's was complemented by echoing birds over Bradley Pond. Standing in Panther Brook while surrounded by mist with a crack of lightning close over head makes you feel alive. If the risk out weighs the reward, no matter how much pride you have sometimes you just need to turn around. The Santanonis(Nemesis) won this one, all the sweater the next time through. From Bradley Pond Lean-to five miles of Heaven awaited us in heading back. Good food is always key after a hard hike so we stopped at the Adirondack Hotel for some burgers and beers. Across the way Helms Aero Service temped our sense for satisfaction. That plane ride was probably the best 30 dollars I've spent. Colleen and Jess had enough with all the bad weather and headed back home with the Mountain dog Tanner while Seth, James and I went back to Lake Placid for round 3. What better than a room at the Econo Lodge, jumping into the hot tub to sooth sore muscles and the anchovies and cheese pizza, well lets just say that's the first and last time I'll be eating that. The storm past clearing a path to the Lower Range. From Lake Placid through Keene Valley to the Garden Trail head. This hike was by far the best. Over many streams and brooks, passing waterfalls and climbing steep rock walls, exploring caves on Gothics will make this my favorite thus far. Upper Wolfjaw to Armstrong, from Gothics back over to Lower Wolfjaw. Having to hit up Armstrong and Upper Wolfjaw twice made it all the better. 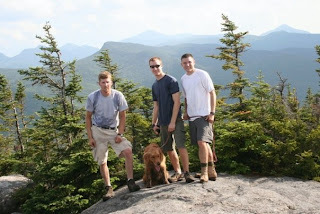 6 peaks in one trip for you, out of a possible 9 had the Santanonis gone differently...2008 was a productive year in terms of your Adirondack 46er progress!